One of the key people in the transitional period of reorganisation of the UFOIC group in the wake of Dr. Miran Lindtner's untimely death in 1969 was David Buching. He was a member of Frankh Wilks' group UFO Research Projects of Australia (UFORPA) which had emerged in the early 1970s in part as a response to the slump in UFOIC activities that occurred after Miran Lindtner's passing. UFORPA sought to energise and revitalise active research and investigation, and found it difficult to do this within the existing structure and then current disposition of UFOIC. Members of UFORPA even tried to take UFOIC over in December 1972 in an effort to envigorate the lapsing activities of UFOIC. The attempt was unsuccessful, but within a year and half elements of UFORPA led by David Buching did achieve this objective, but without Frankh Wilks, who by then (early 1974) had to put his UFO group activities on hold for personal reasons. A number of members of UFOIC (including Fred Phillips, Bill Moser, and Michael Smyth) participated in this process and a revitalised UFOIC was underway by early 1974. 1973 was a year of tremendous flux in UFOIC activities. Limited investigations were being undertaken by UFOIC and UFORPA seemed to be more active in this area. This was reflected in a Channel 7 TV documentary which appeared in early 1973. Written, producted and presented by news veteran and the face of Channel 7 news Roger Climpson "UFOs Fact or Fiction?" presented a lot of sighting material from UFORPA investigations. UFORPA's attempted UFOIC "coup" in December 1972 further unsettled the remanents of UFOIC that had limped into the early 1970s. While UFORPA survived in a manner through 1973, Frankh Wilks' departure led to a diffusion effect between URORPA and UFOIC - a "marriage" that had been developing throughout 1972, then briefly aborted by years end because of the "coup" attempt. The visit of Dr. Allen Hynek to Australia in August 1973 helped the process of the diffusion of active and interested elements in UFOIC and UFORPA to combine forces in a reborn UFOIC. These were slowly nutured developments which were formalised by early 1974. As a country NSW member of UFOIC I remained largely removed from these developments, but I remained very receptive to any active investigation and research developments in the "on and off" UFOIC/UFORPA "marriage". These were best communicated to me by David Buching. Early in 1973 I had visited Sydney and was disappointed with the lack of focus and activity that seemed evident in UFOIC. I even found a recent investigation report of a striking close encounter I had documented (which was later published in the British Flying Saucer Review Vol. 19, No. 5, Sept - Oct 1973 as "Tractor driver under "cold scrutiny" by UFO") languishing in a pile of UFOIC case files in a exposed outside storage shed. It seemed to me at the time that UFOIC was in a drastic decline. My pessimism was short lived when my investigations of the Tyringham Dundurrabin UFO flap of 1973 (see my post "UFO Flap deja vu" via the OZ Files blog site link opposite) attracted the attention of David Buching and his "UFORPA/UFOIC" investigation team. 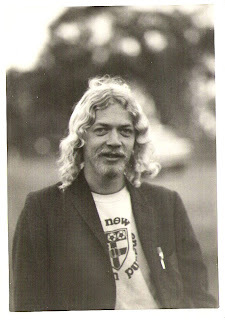 David and members of the team came up from Sydney (on 4 seperate occassions in July, August, October and November 1973). These visits and our close cooperation during them led me to re-evaluate the future of UFOIC. When I finally moved to Sydney in 1975 I quickly became more involved with UFOIC and joined its management committee. David Buching left UFOIC by 1977 pursuing other activities. We have had contact a number of times since then, but recently I have been having difficulty relocating him. Given my current focus on developing a history of UFOIC I would like to make contact with David again. Hopefully we can meet again to catch up with "old times" and to discuss the history and activities of UFOIC. I look forward to it. At last report David Buching was working in the photography field probably still in Sydney. (Photos: David Buching as he appeared in the Channel 7 TV documentary "UFOs Fact or Fiction?" which aired in early 1973. The image was facilitated by the film archivist and critic Jaimie Leonarder. 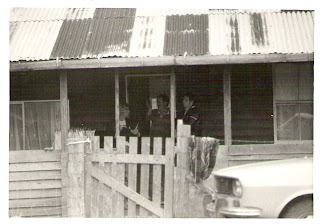 Thanks Jaimie; the investigation photo on site at Dundurrabin on 7 October 1973 shows myself, a local witness and David Buching (left to right) discussing a UFO sighting; a photo from the same day at Dundurrabin of myself - hey it was the 1970s and I was a science degree uni student! Those were the days ...? - the last two photos are copyright Bill Chalker).